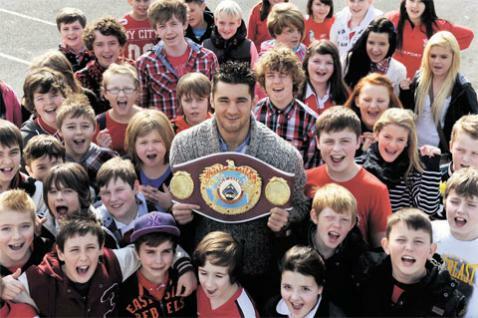 BOXING hero Nathan Cleverly went back to school to meet his old teachers, have a free lunch in the canteen and meet another highachieving pupil. Fresh from a successful defence of his WBO world light-heavyweight title last Saturday, Mr Cleverley, 25, breezed through the reception doors at Blackwood Comprehensive as if he was still a pupil himself. Swamped by children asking him for autographs, the Cardiff University maths degree graduate said he comes back as often as he can. He added: “It’s great to come back to my roots. “I did well in sport and academically, so I just hope I can inspire the children. Mr Cleverley met Billy Tudor, from Cefn Road, who at six had a reading age of four, struggled at school and hated going. But when dad Mark, 38, saw a programme on television about former rugby player Scott Quinnell’s battle with dyslexia, he realised Billy had many of the same problems. Mr Tudor and mum Katy, 31, were able to enroll Billy, now 12, on the Dore programme – which helps stimulate parts of the brain through things like throwing bean bags, bouncing on an exercise ball and tracking moving objects on a chart. It was so successful that by the age of ten, his reading age had shot up to 14. Billy now loves going to school and has raised nearly £1,000 to help others benefit from the Dore Programme.